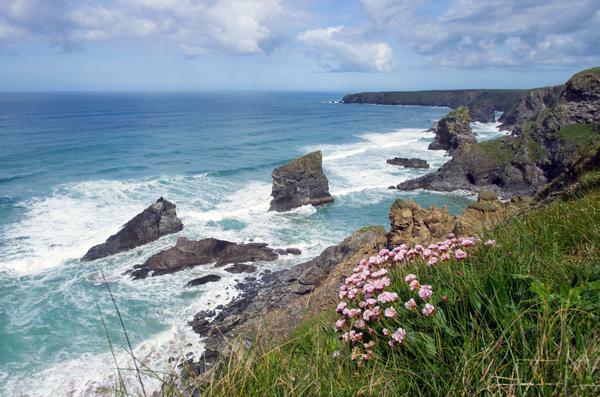 The National Trust is best known for its grand stately homes and estates, but it also manages 709 miles of coastline and 254,000 hectares (627,000 acres) of English countryside. 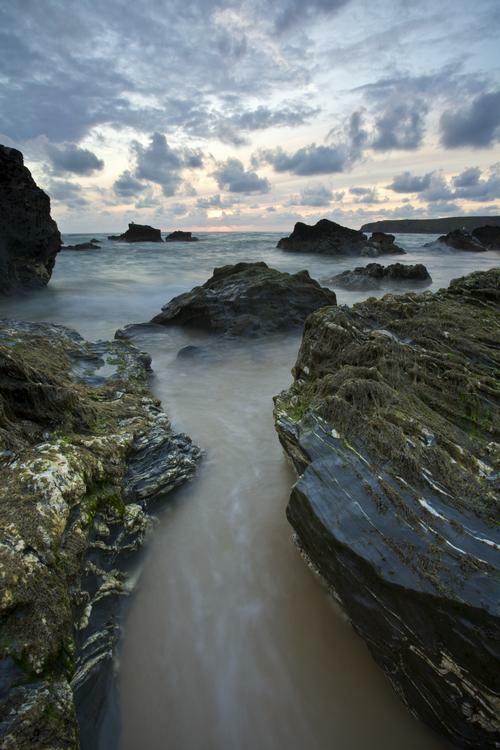 One of the best-known beauty spots in The National Trust's care is the Carnewas and Bedruthan Steps. 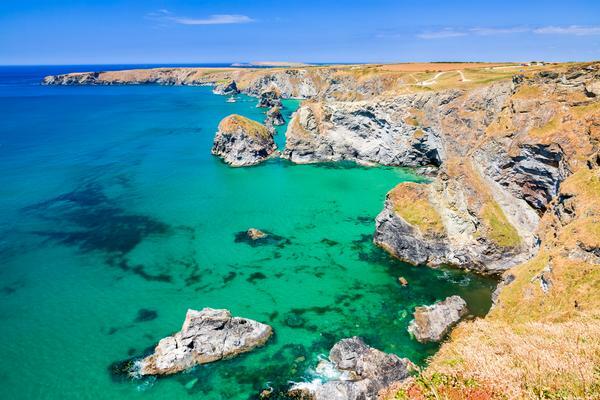 They are situated a few miles east of Newquay on the coast of North Cornwall. Access to this stretch of coastline is free, although there is a charge for the use of the car park. The Bedruthan Steps are a lot more exciting than they sound. They are an impressive series of natural rock stacks on a small sandy beach about a mile north of Mawgan Porth near St Eval. 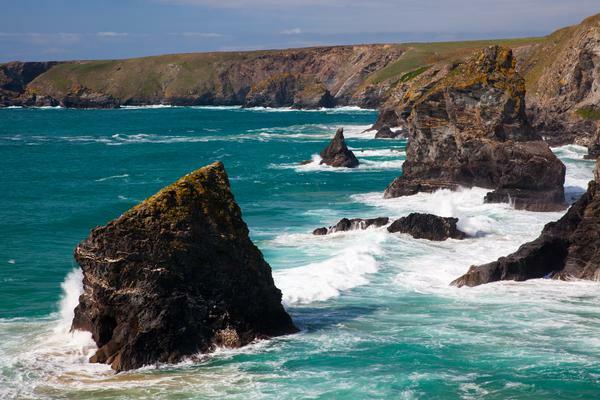 Carnewas is the location of the nearest and largest car park serving this spectacular area of Cornish landscape. 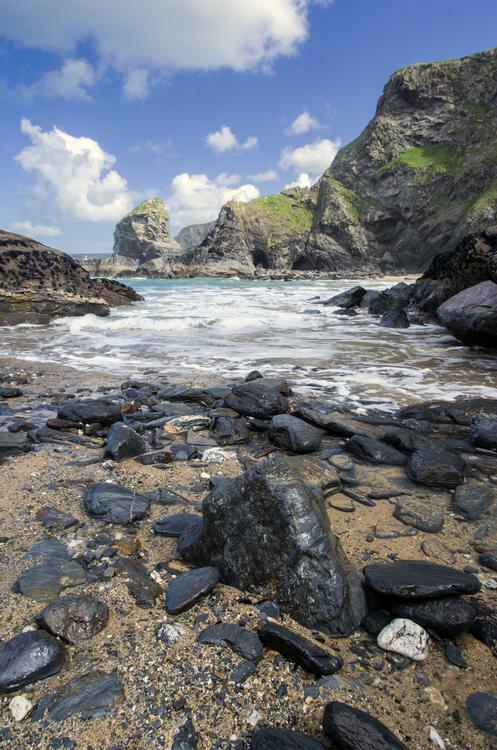 The steps have been formed over time as the Atlantic Ocean has eroded the cliffs, leaving a series of tall rocky stacks which stretch across the sandy beach from Pendarves Island to Diggory's Island. It is possible to walk down the 142 steep steps (these are not the Bedruthan Steps!) in the cliff face to access Bedruthan Beach, but they are extremely steep and tricky. The beach is beautiful but there are many warnings about the swift tide possibly cutting walkers off, which should be taken seriously. Swimming is also discouraged due to the strong rip currents, fast tides and submerged rocks. The beach has a large cave at the foot of the cliff steps and visitors can stroll around the stacks and sunbathe on the inviting sands. Alternatively, take one of the fine cliff walks along The National Trust owned headland. 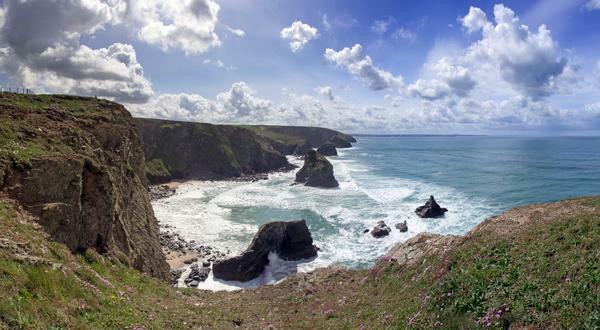 Head north and enjoy the fantastic sea views before reaching the Pentire Steps, now lost in a rock fall, and proceed on along the cliff path around Park Head. In the surrounding area there are two Iron Age hill forts and six Bronze Age burial barrows which can be located using a large-scale Ordnance Survey map of the area. 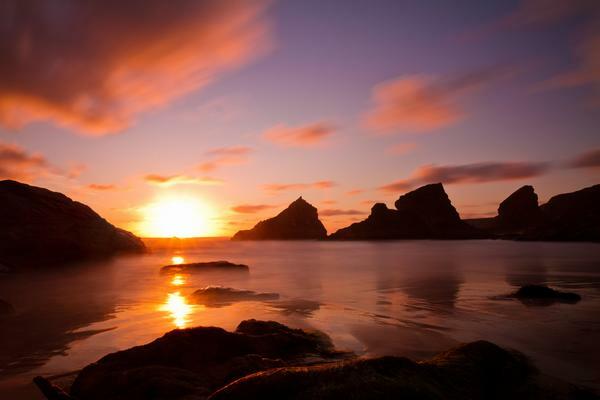 Of course, many legends have grown up about the origin of the stacks, the most popular story being that they are stepping stones used by the giant Bedruthan to cross the bay from Park Head to Berryl's Point. One of the stacks is named the "Samaritan" after a cargo vessel of that name was wrecked against the pillar in 1846. During certain tides the remnants of the ship's keel can still be seen at the foot of the stack. The local population managed to retrieve much of the cargo of barreled beef and printed cloth, hauling back up the cliffs and spiriting it away before the customs and excise officers arrived! Carnewas and Bedruthan Steps car park has toilets, a cafe and a National Trust gift shop at the beginning of the well-maintained access path to the steps. The adjoining clifftop tea gardens are a beautiful place to enjoy the scenery, accompanied by the sound of the crashing waves. The National Trust has also provided some picnic tables on the smaller secondary car park, located a little further north. Just off B3276 from Newquay to Padstow, 6 miles south west of Padstow. Â¾ mile of South West Coast Path on property.